Vasilav Nijinsky, a celebrity dancer with the Ballets Russes. His picture appeared in the Dayton Daily News on February 4, 1917. When you hear “Russian ballet,” Dayton, Ohio probably isn’t the first thing that comes to mind. But on February 8, 1917, the Ballets Russes, a radical Russian dance company based in Paris, performed at the Victoria Theater. That was twenty years before Dayton had its own ballet company. Listener Sandra Harewood learned about the performance and asked WYSO Curious to investigate. What was the Ballets Russes? The Ballets Russes was avant-garde in Europe. Its director, Sergei Diaghilev, made a point of commissioning new music from up-and-coming composers like Stravinsky and Rimsky-Korsakov, set designs from artists like Picasso and Matisse, and costume designs from Coco Chanel, among others. It wasn’t without scandal either—when the company premiered The Rite of Spring in 1913, there were riots in the audience. What were they doing in Dayton? 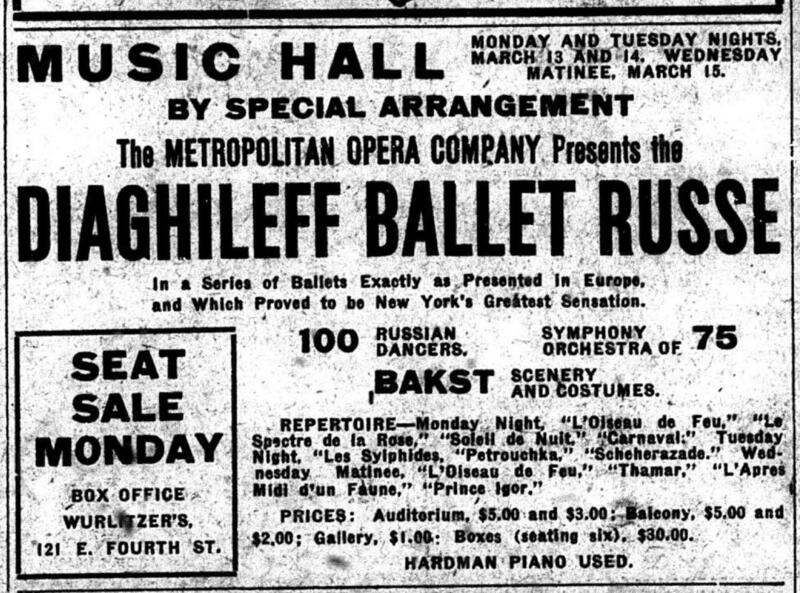 This ad for the Ballets Russes appeared in the Cincinnati Enquirer on March 4, 1916. The ticket price, five dollars, was expensive for the time. The ad also stretches the truth; the 75-piece orchestra really only had about 40 or 50 members. The first year of the tour stopped in 17 places—mostly large cities like New York, Chicago, and Cincinnati. 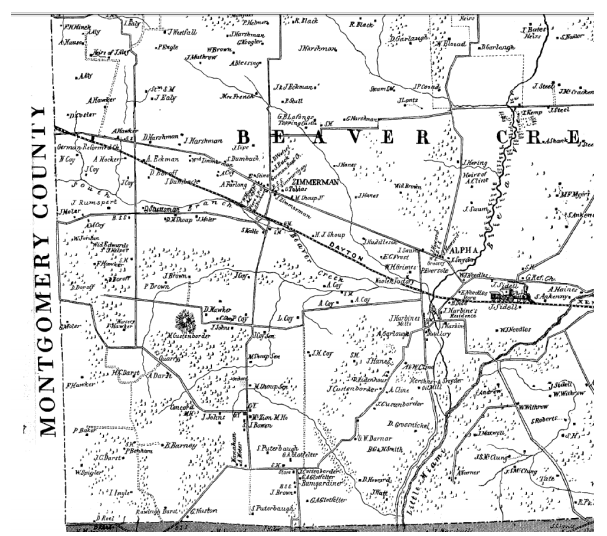 However, the second year of the tour included 55 smaller towns like Dayton, which hadn’t seen them yet. By the time they’d reached Dayton, morale was low. The dancers were exhausted, and running out of money. Vasilav Nijinsky opines on college football. This article appeared in The Dayton Daily News to publicize the Ballets Russes Performance. 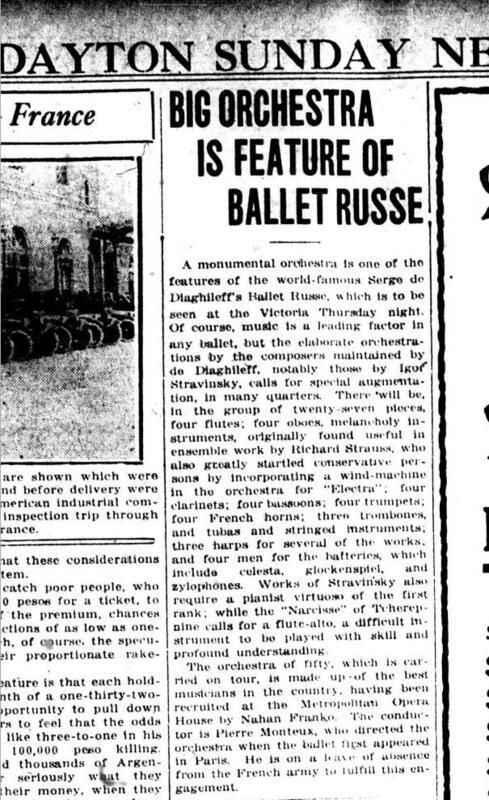 We don’t know much about what the Ballets Russes thought of Dayton, but we do know a bit about what Dayton, or at least the Dayton press, thought of them. At the time, the city didn’t have its own orchestra, and the Dayton Ballet wasn’t founded until 1937, twenty years later. Visits from Europe would have been quite rare, but, surprisingly, the performance was a box-office flop; the Victoria Theater was only about half-full. The audience that did show up was largely disappointed, since the press had over-hyped the performance. Local newspapers floated names of composers like Stravinsky, and controversial new ballets like Scheherazade, which weren’t on the program. They also promised an appearance from Vasilav Nijinsky, a celebrity dancer who was traveling with the company as their tour director, but not as a performer. 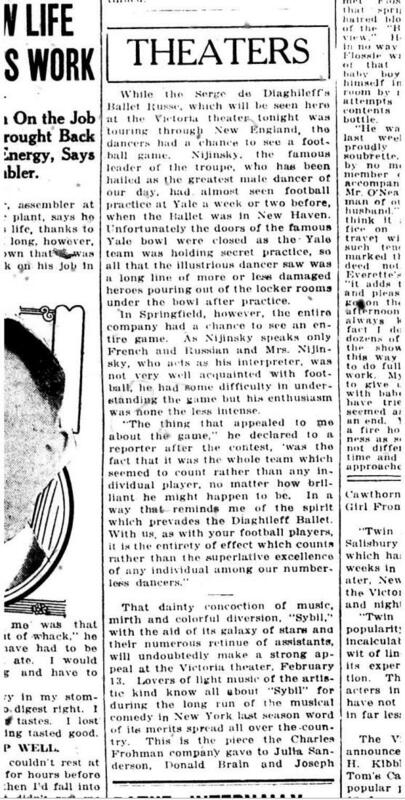 In an attempt to create interest about Nijinsky, papers had even printed a story about the dancer’s visit to a college football practice. Sam Dorf talks about an odd publicity stunt involving celebrity dancer Vasilav Nijinsky and college football. Daytonians weren’t wild about the dancing, but the music really caught on. In Dayton, the Ballets Russes performed Papillon, Cleopatre, and Thamar, pieces by French and Russian composers. 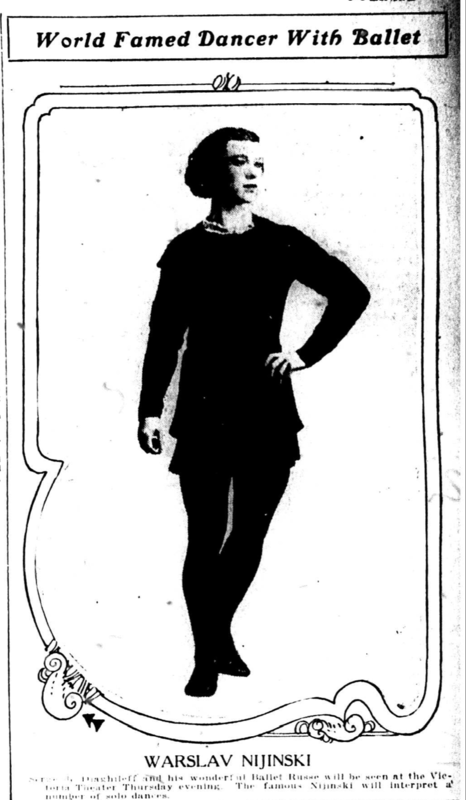 Dayton Daily News front page on February 4, 1917, a few days before the Ballets Russes performance. The reporter seems more interested in the orchestra than in the dancing. His research also showed that after the 1917 performance, people in Dayton could hear a traveling orchestra perform French or Russian music at least once a year. The Ballet Russes performance changed the kind of music people in Dayton got to listen to. But Dorf says that part of the magic of their performance is it can never be recreated. “What’s really interesting about ballet history,” he says, “Is that it exists in memory, and in bodies that die. But it’s exciting to find, in our own community, these spaces where these bodies danced." See Ballets Russes costumes here. WYSO Curious is our occasional series about your questions and curiosities—let us know what you are curious about in the Miami Valley, and your question could get answered by a WYSO reporter. WYSO Curious is a partnership with Hearken, founded by Jennifer Brandel based on her work at Curious City/WBEZ Chicago. 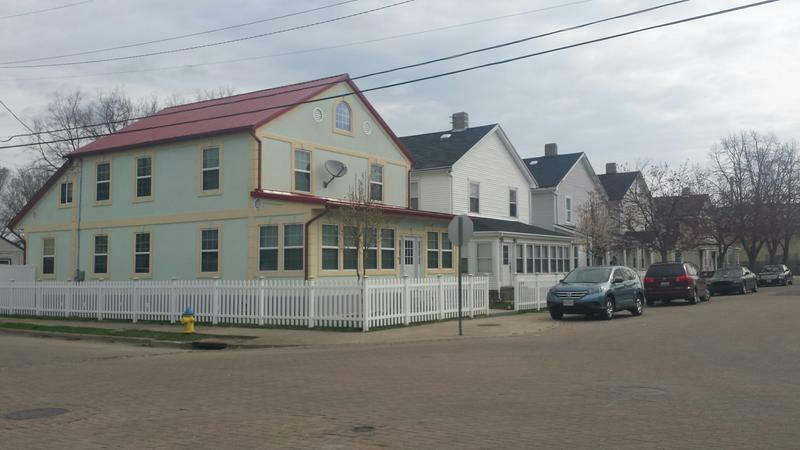 In today’s WYSO Curious, we field a question from WYSO listener Delaine Adkins, who lived in Budapest Hungary for a couple years and was curious about an historic area in Dayton called Hung-Town. She wondered whether there were still any residual influences from the original occupants. When Converse Griffith’s question, How did Indian Ripple road get its name? won our April WYSO Curious vote, the investigation seemed simple enough. This question and subsequent questions about the difference between Indian Ripple and Indian Riffle, an older name for the road, turned out to be quite a mystery for the local and statewide experts we consulted. Not many clear records exist, but we’ve been able to draw several conclusions.